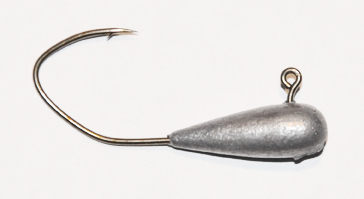 Typically thrown in the winter time or cold water periods, these baits emulate a dying shad to the "T"! This is one of those baits that will sit in your tackle box 10 months out of the year and get little game time...THAT needs to change. This bait is highly effective when bass suspend just off the bottom and will not eat a carolina rigged bait, soft plastic or jig. Deadly in the winter...yes. Limited to winter...absolutely NOT!! All baits come standard with 3D eyes, a #2 snap, Mustad Triple Grip hooks held on with split rings to deter fish from throwing these ultra sharp hooks! Gamaktsu Round bends are available. Available in Nickel, Brass, and Powder Coated options.